Roguish runaway stars can have a big impact on their surroundings as they plunge through the Milky Way galaxy. Their high-speed encounters shock the galaxy, creating arcs, as seen in this space wallpaper of speedster star Kappa Cassiopeiae, or HD 2905. 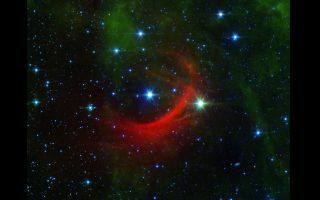 Roguish runaway stars can have a big impact on their surroundings as they plunge through the Milky Way galaxy. Their high-speed encounters shock the galaxy, creating arcs, as seen in this space wallpaper of speedster star Kappa Cassiopeiae, or HD 2905 from NASA’s Spitzer Space Telescope. Kappa Cassiopeiae is a massive, hot supergiant moving at around 2.5 million mph relative to its neighbors (1,100 kilometers per second). But what really makes the star stand out in this image is the surrounding, streaky red glow of material in its path. Such structures are called bow shocks, and they can often be seen in front of the fastest, most massive stars in the galaxy.